Through Prayer: We pray, a conversation with Jesus where we express our love for Him, confess our sins, thank Him for what is happening in our life, and ask for His help in any area of our live – no matter how big or small. This can happen in silence by ourselves, in a group, or through music. Through Meaningful Relationships: We enter into community, seeking friends to support us as we grow and learn to live, love, and lead like Jesus. I’m New Here is a 15-minute tour that takes place every last Sunday of the month after all four services unless otherwise noted. 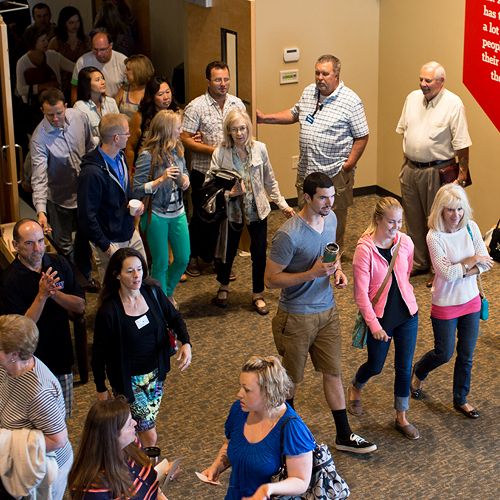 We meet at the front of the stage then split off into groups that tour the building and discuss the opportunities for you and your family to connect into life at Willamette. Tours take place on the last Sunday of each month.